16 DAYS UNTIL THE FEST!! 2012 ARRL Oklahoma State Convention! Free Parking!! - Low Cost ON-SITE RV Parking! Terrific Prizes!! YOU could WIN! Commercial Vendors - Great Products! Fantastic Forums - Learn something new! Flea Market - Great Bargains! and get two bucks off! WE DO NOT HOLD FLEA MARKET TABLES! Get there early to insure your table! Tables MUST be claimed by 8:30AM Saturday! NOON Friday and at 7 AM on Saturday of the hamfest. ATTENTION: any prereg table not claimed by 8:30 Saturday morning will be resold without refund. The Corporate Engagement Award of Excellence is one of the oldest and most prestigious award programs honoring outstanding Employee Volunteer Programs. The award recognizes companies that have made workplace volunteering a central part of their business operation by putting structures, policies and evaluation in place to allow employees to give their time and talent to their communities. Winning companies will be selected based on their ability to demonstrate exemplary evidence of the Principles of Excellence for Workplace Volunteering and will be featured throughout the National Conference on Volunteering and Service June 18-20, 2012 in New Chicago. As a participant with the President's Volunteer Service Award program we realize you may also partner with for- profit corporations that do great work for you. Please share this announcement with companies that you would like to see considered for this award. The 2012 Corporate Engagement Award of Excellence honorees will be announced in June 2012. We look forward to hearing about your great employee volunteer programs. Should you have any questions or require assistance please contact Melanie Stevenson at mstevenson@pointsoflight.org or call 404-574-5378.
the future of our country lies in the education of young people. of the NTS for many years and notably was their first digital operator. Net Control of both the RN5 and Texas CW nets for a number of years. generous and fruitful efforts over the past 30 years. the Central, Midwest, Northwestern and Rocky Mountain Divisions. the ARRLF for the previous two years. are always ready for backup duty in emergencies..."
government agencies in times of extraordinary need. information from area spotters back to the EOC." excellent examples of people making a difference in those communities. make to our great state, both in times of crisis and in times of calm." specifically designed with Amateur Radio driven content. ARRL Chief Counsel Chris Imlay, W3KD to get it launched. the Committee's report to the ARRL Board at their regular meeting. Board of Directors about all RF safety issues. covering 48 states and 5 Canadian Provinces. HamCom's consideration. It's never too early to start planning! Visit the HamCom website today! standing committee, Programs and Services. Katy, Texas to Nanjing, China. with horizontal speeds between 100 and 150 miles per hour." the ARRL Forum at HamCom 2012, and will receive an MFJ Antenna Analyzer. these new rules will go into effect at 12:01 AM (EST) on March 5, 2012.
of the Table of Frequency Allocations and our service rules." authorized by the administrations of other countries. Sponsor: Green Country Hamfest, Inc.
Are you in the Hamfest Mode? - March 3, 2012 8:00 A. M. – ? Thanks to Earl, N5NEB and Dave, KC5SII for this information. My husband, Bill KE5VKB, and I (Cindy Downes K5CED) are fairly new hams and have been wanting to get on HF and do some DXing, but our vertical antenna in the attic just wasn't doing the job. We could hear everyone else, but no one could hear us. Bill is legally blind, so our ham club friends came to the rescue. Thanks to Guy WB5MXO, Cathy WB5MXP, Dan W5BM, and John KN5UPS, as well as Ray KE5WGA, Wayne KW5M and Joe N5TEX, we're now able to get on HF. Dan, John, Ray, Joe and Wayne did some troubleshooting on our Yaesu 857 radio and our old vertical antenna. Guy and Cathy installed the G5RV antenna. 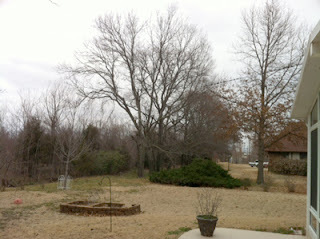 We hooked one end of the wire to a tree behind my house; the other end around a roof vent. The ladder line hangs above our porch and hooks to coax which goes through the window into our shack. You can see part of the ladder line of the antenna in this photo. After we got it set up, Guy contacted NC and Canada. Then I got on and made contacts to PA, AZ, and OH. I also heard Hawaii, but wasn't able to get through the pileup. All the stations we talked to said our signal was S9+. It was amazing! This was truly a team effort and one well appreciated. This is a ham radio club at its best. On February 7, 2012, beginning at 10:15 a.m.* CST Amateur Radio Emergency Service-Oklahoma will be calling a radio HF net on 7260 kHz a in participation with the 2012 Great Central U.S. ShakeOut! More than one million people across nine states will participate in the 2012 Great Central U.S. ShakeOut! Then, get up, dust off and ALL radio amateurs in Oklahoma, Arkansas, Missouri, Illinois, Indiana, Kentucky, Tennesse, Mississippi & Alabama are requested to check in to the HF net on 7260 kHz and participate with ARES. Following the KISS principal this net will be a CHECK IN ONLY net only. Check in with your call sign and location. No traffic will be handled by this net. The net will open at 10:15 a.m.* CST on 7260 kHz and run no more than one hour. The Net Control Stations will be Joe N5TEX and Jack KB5KKT. 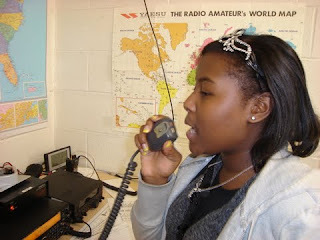 Clifton Harper KE5YZB continuously tells the young Vikings that amateur radio will open doors for them. By listing your amateur radio association on your college application, it may be the one reason your application is selected above all the rest. Such was the case described by 12 year old Sh’Kyra, KF5NNT after she followed that advice, but not for a college application. KF5NNT is in several honor classes, amateur radio club, and participates in pageants. At a recent pageant competition the selection process was tight, really tight. As part of the application process, Sh’Kyra took Mr. Harper’s instruction to heart and listed amateur radio as an activity. As the pageant continued Sh’Kyra was asked about amateur radio and her involvement. Sh’Kyra explained that in amateur radio we talk to people, build antennas, learn about electronics, safety, and patience and use a lot of math. When asked what was the farthest distance she talked? She proudly replied “ITALY”! The judges observed and listened in silence, and soon announced Sh’Kyra’s selection. Sh’Kyra has been in the radio club for over a year, starting her amateur radio career as a shy very soft spoken participant, always willing to try, always willing to learn, always willing to take criticism and advice. She has developed a “radio” voice that easily fills the classroom (and hallway). Now Sk’Kyra the oldest of 3 siblings, finds herself coaching and correcting her peers. This same confidence while speaking to peers and seniors certainly added to her presence in the eyes of the judges as she answered those questions. Congratulation Sh’Kyra and thank you for representing amateur radio during your pageants. Yes, put amateur radio on those application. Amateur radio is fun, challenging and requires self study but continues to help open the door of opportunity, just ask KF5NNT. We are heading back to the classroom! Listen for K5USA/KF5CRF this Saturday February 4, 2012, from about 1 pm until 4 pm central time. Find us about 14.295 MHz +- operating from the school station. Follow K5USA on twitter and receive 1 tweet informing you of the active frequency. Have a great weekend and as always, please stop in and tell the young Vikings about your school, club, museum, ship, troop or yourself. Repeat visitors always cause renewed excitement. Thanks to KC5CYY for this report.